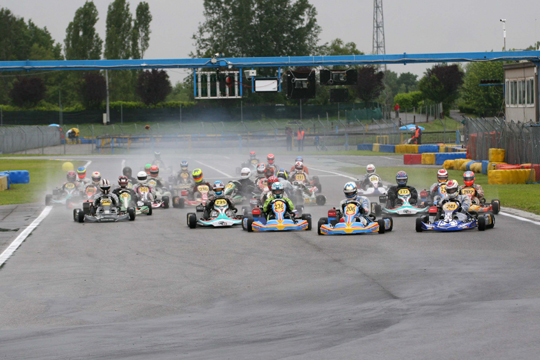 The second round of the Rotax Euro Challenge, held at the Circuito 7 Laghi in Castelletto, saw record attendance in absolute terms (never a second round counted as many as 170 drivers during the school exams period). Unfortunately drivers as well as the crowd could not benefit from the usual spring time weather of this period, but the races were spectacular nonetheless with several twists. The second round of the Euro Challenge also recorded the biggest number ever of Italian participants with 13 at the starting grid, 10 of which in Senior category alone. In Senior, the category with the largest number of participants - 76 – the reigning Rotax Grand Finals Junior champion Harry Webb was able to win the pole position in qualifying, hitting the top result both in the pre-final and final. The competition was fierce, with the recent winner of the first round of the European KZ Championship Max Verstappen proving very hard to beat. After getting familiar with the equipment, the Dutch managed to take second place in the prefinal also stopping the fastest lap, and ending on the second step of the podium in the final. Brand won the third place. In Junior, Chinese driver with English license Guan Yu Zhou took the front row after the heats as well as the pre-final win ahead of Hall and Timmermans. But in the final Lamborelle managed to grab the win ahead of Hall and Kristensen with the Chinese having to settle for fourth place. In DD2, the two-speed class, Belgian De Ruwe was unmatchable in qualifying as well as in the pre-final and final. Juodvirsis tried to put up a challenge hitting three wins out of three in the heats, but in the pre-final he had to settle for second place, while in the final he had to give in to Kancsar, Lahio and Lennox-Lamb finishing in fifth place. Good comeback in the final reigning Rotax Grand Finals DD2 Champion Ben Cooper finishing 7th from 11th on starting grid, and for Italy’s Alessandro Manetti, who closed in 8th from the 13th on starting grid.